Motherwell defender Josh Law has hailed Mark McGhee’s contribution since becoming ’Well boss in October following the sacking of Ian Baraclough. McGhee, newly named Scottish Premiership Manager of the Month for December, has improved a struggling team to such an extent that ’Well are on a five game unbeaten run which included last month’s fantastic 2-1 win at Celtic. Josh said: “When a new manager comes in I think unconsciously the players maybe, in training and games, give that 10 or 20 per cent more. “The squad take massive pride from the manager getting this award. “He has done really well and we’ve helped him along the way which is good. 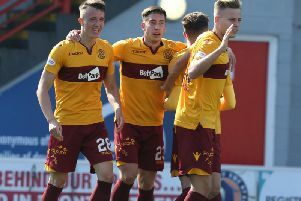 Josh said that Motherwell players “massively” wanted a good Scottish Cup run this season, starting with disposing of Cove Rangers in this Saturday’s home fourth round tie. “We’ll be making sure we’re right at it on Saturday to get a good result and obviously get to the next round of the cup,” he added.